Melbourne’s Royal Park could soon be overlooked by a number of high-rise apartment buildings. Development Victoria has proposed changes to the Freeway Apartment precinct, which is part of the former Commonwealth Games village. Changes would see the initial height limits of the buildings doubled. 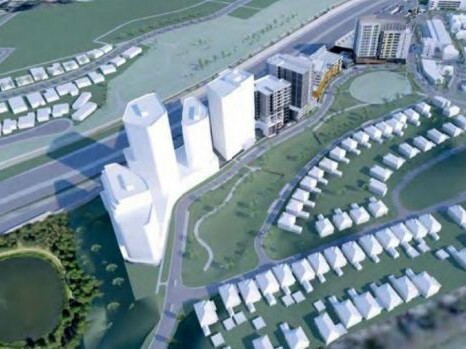 One of these proposed developments is a tower for the western edge of the village. Originally planned as a 40-metre, eight-storey building, Citta Property now wants to increase this to 79 metres (or around 23 to 25 storeys). Additional levels would permit an extra 388 apartments to the development. Development Victoria says the new tower would be an acoustic barrier and a "visual link" between the park and the village. Of course, not everyone agrees. The City of Melbourne has written to Victoria’s planning minister, Richard Wynne, to oppose the changes. Nicholas Reece, chairman of the city's planning portfolio, told Fairfax Media that City of Melbourne thought “the height and bulk of the development proposed was completely over the top”. "It doesn't give proper respect to the Royal Park context, as a significant parkland." Wynne will consider the changes once all submissions have been lodged. Covering 181 hectares, Royal Park is the largest of Melbourne’s parks. The designated parkland has a long history of use for relaxation and sport, and this continues today. A large range of activities – including tennis, golf, football, baseball, cricket, netball, hockey and cycling – take place regularly in the parklands. Royal Park contains open grass areas, as well as areas of eucalypt forest. It is home to possums and a variety of birdlife.